FRANKLIN, Pa. (EYT) – The 36th Annual Applefest is underway in downtown Franklin. 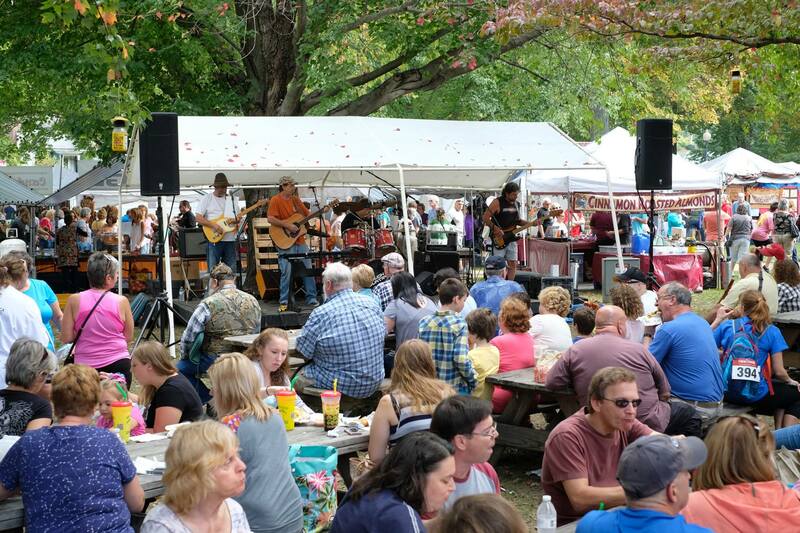 More than 300 craft and food vendors, as well as live entertainment, are highlighting the three-day celebration that began today, Friday, October 5, and ends on Sunday, October 7. The Applefest event began as a pie-eating contest in 1982 and has grown to one of rural Pennsylvania’s biggest events. But, its true roots were found in the fabled folk hero John “Johnny Appleseed” Chapman, who lived in the Franklin area from 1797 to 1804. Chapman planted apple trees throughout the area and across the Midwest. According to its website, franklinapplefest.com, more than 30 years ago, a newcomer to the Franklin area, Mrs. Lee Chapman, no relation to John Chapman, was impressed with the abundance of red apples that grew in the Franklin area and visited the Franklin Area Chamber of Commerce office expressing “enchantment” with the area. Coming from an arid region of South Africa, Chapman was especially impressed and thought the apples should be celebrated and would make a fabulous basis for an event that could help improve the spirits and instill some old-fashioned community pride in the residents who had been hard hit by an economic downturn. Combining Mrs. Chapman’s suggestion with the area’s historical link to the fabled folk hero Johnny Appleseed, the idea for Applefest was born. The event began at 6:00 a.m. today with the much-anticipated Apple Pancake Breakfast at St. Patrick School (Sponsored by Edward Jones), located at 10th and Buffalo Streets. Along with the craft and food vendors, some local retailers, like Feldman Jewelers, are hosting special sales, as well. Lewis noted that one change this year is that all of the apple dumplings will be homemade by students at the Venango Technology Center. Church Tour – Franklin Preservation – The church is located at 11th and Buffalo Street (across from the playground) Tours will be at 2 p.m.
Ashleigh Bennett – Bandstand Park, 10:00 a.m. to 11:00 a.m.
Max Schang – Fountain Park’s Food Court, 10 a.m. to 11:30 a.m.
HOLeY Jeans – Food Court, 12 p.m. to 1 p.m.
Church Tour – Franklin Preservation The church is located at 11th and Buffalo Street (across from the playground) Tours will be at 1 p.m.
Mel Brooks’ THE PRODUCERS – Franklin Civic Operetta Association presents Mel Brook’s The Producers at the Barrow-Civic Theatre, 1223 Liberty St., Sept. 28 and 29, Oct. 4, 5, and 6 p.m. to 7:30 p.m.; Sept. 30 – 2 p.m. For tickets call 814-437-3440 or visit www.barrowtheatre.com. Arts/Crafts/Entertainment – 10 a.m. to 6 p.m. Growing Through Challenges Obstacle Course – PNC employees will be on hand to help children as they make their way through the bank’s outdoor obstacle course. Through their participation, children (ages 2 – 6) will prepare for success in life. An award will be presented to each participant. Sponsored by PNC Grow Up Great. Hidden in Plain Sight – A mock teen bedroom in a trailer to educate parents about the everyday itemsthat might indicate drug use. The trailer has been used extensively at many events, received national recognition and is now being duplicated by other counties and states. It is owned by Lake Erie Youth Road Crew, a group of 7-12th graders “Reaching Out Against Destruction” in Erie County. It was created as an Eagle Scout project in memory of a brother lost to drugs and in an effort to educate others. The trailer will be available for tours. DUI Trailer Display on 12th Street. Venango Regional Airport Fly-In – Complimentary breakfast & shuttle service for fly-in vistors to Applefest. Church Tour – Franklin Preservation – The church is located at 11th and Buffalo Street (across from the playground) Tours will be at 1 p.m.
Buy One-Get One Cosmic Bowling – Buffalo Street Lanes – 1244 Buffalo Street, Franklin – 814-432-4310, 9 p.m. to 11 p.m.; 11 p.m. to 1 a.m.
Tiffany Window Tours – St. John’s Episcopal Church, 1145 Buffalo St. Tours at 10 a.m., 12 p.m. and 2 p.m. Sunday at 2 p.m. Doors open 8 a.m. to 8 p.m. Fri & Sat. Porch Music Store – $5.00 off a Porch Music Store Build Your Own Canjo Workshop (on the hour) on Saturday, 10 a.m. to 4 p.m., 409-411 13th Street, Franklin PA 16323. Apple Pie Baking Contest – Deliver pies to the Barrow Theatre, 1223 Liberty Street, between 11:30 a.m. to 1 p.m. Pies must be in disposable pans. Winners will be announced in the Bandstand at 5 p.m.
Apple Pie Eating Contest – 4 p.m. in front of the Information Gazebo – Be sure to enter your name at the Information Gazebo (H6) if you would like to try to be a contestant. Who can eat their pie the fastest? Stop by and cheer them on. Arts/Crafts/Entertainment 10 a.m. to 5 p.m.
Franklin Elks Breakfast– 7 a.m. to 11 a.m., Elks Lodge located 13th & Buffalo. Open to the public. $10 for adults, $8 for children. Tickets available at the door. Benefits the Elks Home Service Nurses’ Program. For more info, call 814-432-8119. Tiffany Window Tours – St. John’s Episcopal Church, 1145 Buffalo St., 2 p.m.
Mel Brooks’ THE PRODUCERS Franklin Civic Operetta Association presents Mel Brook’s The Producers at the Barrow-Civic Theatre, 1223 Liberty Street. For tickets call 814-437-3440 or visit www.barrowtheatre.com. Franklin Public Library Used Book Sale – 421 Twelfth St. – 10/1-10/5 – 10 a.m. to 8 p.m.; 10/6 – 10 a.m. to 5 p.m.; 10/7- 12 p.m. to 5 p.m.
Farmer’s Market – 12th Street – Oct. 5 and 6, 10 a.m to 5 p.m.; Oct. 7- 10 a.m. to 4 p.m.
Johnny Appleseed will be strolling through the festival Oct. 5 and 6 from 12 p.m. to 5 p.m. and on Oct. 7 from 12 p.m. to 3 p.m. Be sure to say hello. FREE Applefest Coloring Station (prizes awarded) and $5.00 off a Porch Music Store Build Your Own Canjo Workshop (on the hour) – on Saturday, 10 a.m. to 4 p.m., Porch Music Store 409-411 13th Street, Franklin PA 16323. Come get your photo taken with the frog and win a chance to win a FREE Ukulele! Tiffany Window Tours – St. John’s Episcopal Church, 1145 Buffalo St., Oct. 5, 6 – Choice of 3 tours at 10 a.m., 12 p.m., and 2 p.m.; Oct. 7 tour at 2 p.m. Doors open 8 a.m. to 8 p.m. Fri. & Sat. There is a per person charge for tours. For more information, directions, and planning a stay, see its webpage at franklinapplefest.com. View Applefest’s schedule of events here. The City of Franklin, Pa.
Industrial Truck and Crane, Inc.
WM R. Karns Plumbing & HVAC Inc.
Sandy K. Hovis Insurance Agency, Inc.